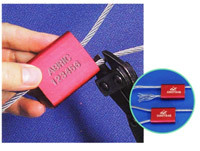 Cable security seals - buy now. Alulock is a high security, variable length, cable security seal, which is CTPAT, ISO 17712 & UK/US customs compliant* for use with containers and trucks etc. It is supplied in cartons of either 250 or 500 seals of 300mm length pre printed with sequential numbers and is normally available for dispatch within 1-2 days. Cable security seals, 300mm length with a choice of cable widths, pre printed with sequential numbers. 1.5mm width, 500 seals @ £0.66p each excl VAT & carriage. 2.5mm width, 250 seals @ £0.77p each excl VAT & carriage. 3.5mm width, 250 seals @ £0.79p each excl VAT & carriage. If you're not too fussy about colour, please select 'any'. Need to buy smaller quantities ? Check out our specials page. * Please note, these products are only available to purchase online, for UK mainland customers. If you wish to purchase from outside this area please do not hesitate to CONTACT US FOR A RAPID QUOTATION. All prices above exclude carriage & VAT which is added at checkout. Do you need tech specs or a customised version ? Perhaps you require price breaks for larger quantities ? Contact us for options and pricing.